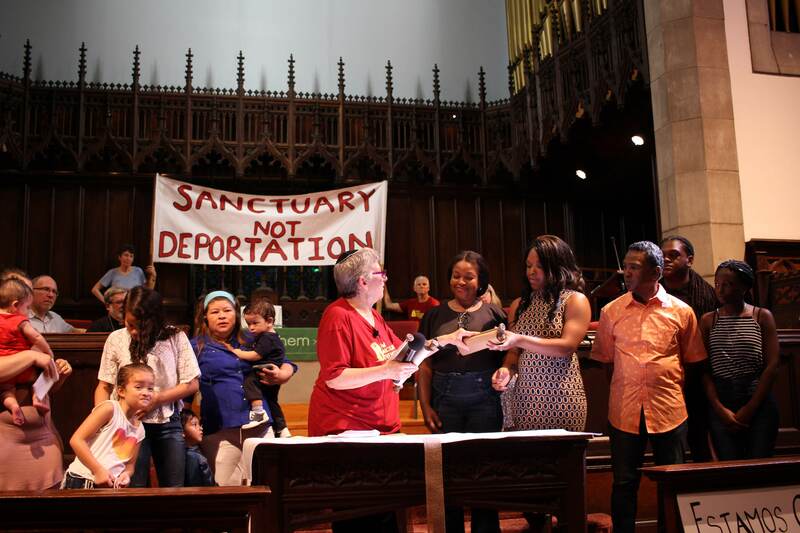 11/18/2014: “Undocumented immigrant seeks sanctuary in Philadelphia church,” Daniel Kelley, Yahoo News! 8/1/14: “Immigration reform can’t move forward until Obama takes action,” Ana Gamboa, Al Dia. 6/28/14: “Immigration Reform Advocates Fed Up, Want President Obama to Take Action,” Cherri Gregg, CBS Philly. 5/1/14: Ruth Hernandez’s video about New Sanctuary Movement wins national competition for student filmmakers by Steven Spielberg and the US Shoah Foundation! Ruth is a high school student at Esperanza Academy in Philadelphia. 4/17/14: Philadelphia Bars Transfer of Undocumented Immigrants Without Federal Warrants, Democracy Now. “Philly police will no longer hold immigrants on behalf of ICE,” Emma Jacobs, Newsworks WHYY. “Alcalde de Filadelfia firma medida contra las deportaciones,” Univision65. “Phila. acts to halt immigrant deportation over minor crimes,” Michael Matza, Philadelphia Inquirer. 4/16/14: “Filadelfia pondra fin a la colaboracion entre policia e inmigracion,” Arturo Varela, Al Dia. 4/15/14: “Mayor expected to sign order curtailing police-ICE collaboration,” Julie Shaw, Philadelphia Daily News. 2/21/14: “Juntos desde City Hall. Basta a la polimigra,”Leticia Nixon, El Sol. 2/21/14: “Should Philly Welcome or Deport Undocumented Immigrants?”Interview with our organizer Nicole Kligerman, Joel Mathis, Philadelphia Magazine. 2/20/14: “Nutter to end agreement with ICE on detention,”Troy Graham and Michael Matza, Philadelphia Inquirer. 2/12/14: “Denuncian en South Philly perfil racial por parte de la policia,” Arturo Varela, Al dia. 1/10/14: “Debate over municipal-IDs for immigrants,”Michael Matza, Philadelphia Inquirer.